Les Pounder has many Raspberry Pis and this means he needs to write a lot of cards. Can this application help him save time? A GUI tool to create SD cards for Raspberry Pi, and bootable USB drives for distro hoppers. Etcher has built-in safety features to minimise risk of data loss. With this new version we see new features such as writing to multiple SD cards and writing to external devices such as the Raspberry Pi Compute Module and Pi Zero. Here’s Etcher in action, detecting two drives before burning data to an SD card. Every Raspberry Pi has one thing in common and that’s the SD card used as the boot device and local storage. Writing SD cards – especially multiples – is the bane of those users who run Raspberry Jam events as it takes so long to do it. Sure, we can use dd or dcfldd to write multiple cards, but one slip with the keyboard could equal disaster. Step forward Etcher, a GUI application that offers flexibility and a safe workflow to create cards. Designed for use by users of all abilities, Etcher is an Electron app, a single executable file that’s downloaded and run with no installation necessary. 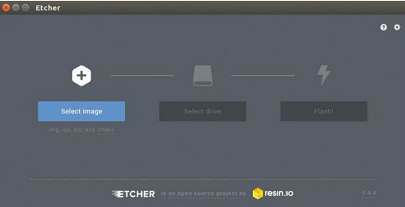 Etcher is available for Linux, OS X and Windows, and works in exactly the same manner across all platforms. 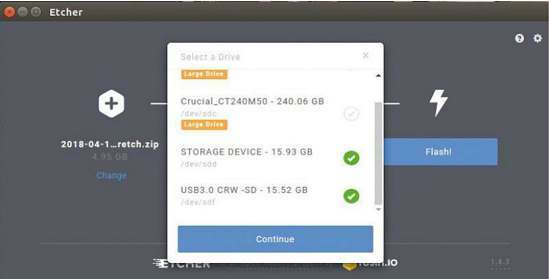 In its simplest form, Etcher can write an image – be it an SD card image or an ISO for use with bootable USB drives – to your intended target device. And in this simple task Etcher is sublime, thanks to a simple, three-step interface. Pick the source of image, pick the target SD or USB device, then click Flash! Write speeds depend on the computer you’re using, but on an average machine the time is around eight minutes for an 8GB image. Etcher is also able to determine if a write has been successful by validating the device after the image has been written, reducing the risk of a trashed SD card. For those users who need to make multiple cards quickly, then Etcher 1.4.3 featured the option to write to multiple devices. The dev claims stability up to 16 devices, refined in this latest version. We tested with two USB 2.0 card readers and found that the images were copied cleanly, albeit slightly slower than a single card. But we were using a second generation Core i5 device; a faster CPU and USB 3.0 will handle multiple cards more effectively. Another new feature is the ability to write images directly to real devices: for example, the Raspberry Pi Compute Modules and Pi Zero. But this is a little tricky because Etcher won’t see these devices by default. Instead, we had to follow a few instructions from the Raspberry Pi blog to clone a git repository and compile a driver to enable access to the Compute Module over USB. Once this was done, we were able to mount the Compute Module and write to the internal eMMC using Etcher. As mentioned, Etcher can also write to Pi Zero boards, but they too need to be mounted using the same method as the Compute Module, and have a completely blank micro SD card inside them. We can also write to multiple Pi Zero boards at once. Etcher has a simple interface that’s exactly the same across the many operating systems. It’s ideal for new users wanting to write SD cards for their Raspberry Pi. With all the fancy features out of the way, Etcher is a solid tool for creating SD cards and bootable USB drives for distro hopping. The built-in safety features reduce the risk of accidental deletion of drives by hiding larger volumes – this can be turned off for advanced users. The new ability to write directly to the Compute module and Pi Zero are great, but they’re fiddly to get up and running. We could only make it work using the hack we described earlier. Furthermore, to write to multiple devices we needed to run Etcher as root or with sudo on Linux (Windows users won’t need to elevate their privileges to make it work), but the Etcher team admit this is something that will be fixed in future releases. But for those that need to make lots of SD cards Etcher is your go-to tool to get the job done right and with minimal fuss. Jam Masters, your prayers have been answered! Simple to use, but with plenty of advanced features, Etcher is a powerful cross platform alternative to the command line.